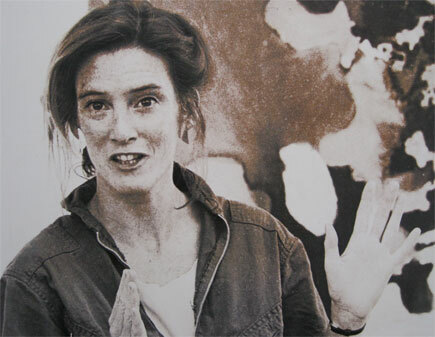 Lynda Reeves McIntyre was trained as a painter and a dancer at the University of Massachusetts, Hunter College and Yale University. She holds a Doctorate in Aesthetics and weaves her training in painting, dance, Buddhist study and aesthetics into her art making and teaching. McIntyre had her first major show in New York at 21. She has since received numerous awards including those from the NEA, the MacDowell Foundation, the JFK Center, the ICCE, the VCCA, the Ossabaw Foundation and the Getty Foundation. She has been awarded art fellowships abroad to Australia, the former Soviet Union, China, Vietnam, Bhutan, Cuba and Italy where she teaches in the summers. Her work is shown throughout the U.S, Europe and the Pacific Rim. Her works are held in corporate and private collections in the U.S, Europe and Australia. McIntyre is a Studio Art Professor and formerly the Chairman of the University of Vermont Department of Art and Art History. McIntyre is a painter whose acrylic and watercolor works find their sources in personal, visceral and visual experiences. McIntyre often works outside, backpacking to sites in all weather conditions, taking notes from ocean, desert, and mountain and built environments. Many of her works find inspiration in the sensuous liquidity of the sea, surfacing toward the sun, toward "the light," arising beneath a wash of azure. Some paintings are poured onto canvas or cotton, worked with one's hands as if swimming or dancing in the sea. Other works examine the changing dynamic tension between airs, sea, land and sky whether it be raw craggy cliffs clawing at a viciously blue desert sky or an ominous yet gentle glow at the water's surface before a storm at sea. Others invite the viewer into a pentimento of man and nature, a ritualistically cultivated hillside or multi-layered architecture. McIntyre focuses on visceral transitions but her clues may be as subtle as a cast of light crossing a rock face or the painted history of an ancient wall. Critics have said, " She dances with paint revealing spiritual and artistic brilliance." "Delicious color, eloquent gesture and luxuriant talent radiate from these paintings." " Intimate paintings that sometimes slap you in the face but more often caress." " Her shows inspire joy and surprise."